One of the advantages for young mothers who stayed at home with their children, as most of my cohorts did in the ’60s and ’70s, was that once their children were at school – and if at parochial school as mine were, lunching there – they had a considerable amount of disposable time they could deploy for recreation and personal growth. Some moms spent a lot of time at the gym, some went back to school, and some, including me, took up community volunteerism. Through friendships, I was introduced to volunteership at Montreal’s venerable Jewish Public Library, where my background in literary studies and interest in Jewish cultural traditions proved a natural fit. I first took on the chair of Jewish Book Month and later headed up the English programming committee. Eventually I ended up as JPL president for a term. First Fruits – so named because it was only open to hitherto-unpublished writers in grades 7 to 12 in Montreal and area, and because the launch date always fell around the holiday of Shavuot with which the term is associated – was an anthology of creative writing by high school students, published annually by the JPL. 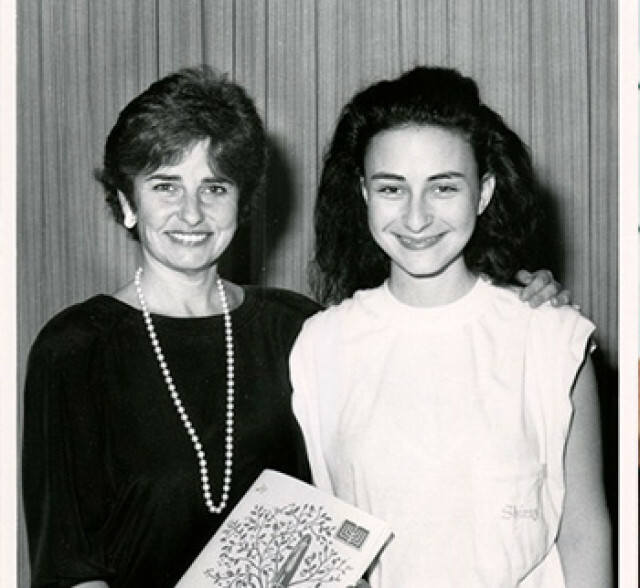 The launches were always very festive evenings for the writers, their parents and teachers, featuring diverse keynote speakers from the writing world – academics, novelists, poets and journalists – whose talks were geared toward inspiration and advice for young authors. The evening was capped with the awarding of prizes. First Fruits was conceived with two goals in mind. The first was to encourage literacy and literary ambition in young people at an opportune gateway moment of their lives, a mentoring task that accorded well with the cultural mandate of the JPL. The second goal was to encourage familiarity and a sense of lasting connection to the JPL itself in this demographic, for whom no other reason brought them in significant numbers to the JPL. Our hope was that First Fruits would serve as a conduit for positive community adhesion in our young writers’ adulthood. At first the experiment was confined to independent Jewish schools. Once successfully established, all public and independent schools were invited to participate, and an art component was added. First Fruits was now a multicultural and religiously pluralist program. The annual launch brought hundreds of diverse youths from all over Montreal and beyond to the JPL, making it one of the JPL’s most successful public outreach ventures. Students could write prose or poetry in one of the four languages associated with Jewish life in Montreal: French, English, Hebrew and Yiddish (in its last years Russian was added). Themes were chosen by the writers and artists themselves. This was for me a critical component of the project, because in most schools writing themes are imposed. Occasionally a somewhat risqué short story provoked unease amongst conservative parents. But although it could be difficult to articulate the bright line between admissible creativity and inappropriate content, I was determined to give students as much latitude as possible, and trusted my instincts, as well as those of my deputy editor for many years, Bruce Henry. We were the final arbiters of a process that included a number of volunteer readers for initial triaging and a prize jury made up of professional writers and educators. One of the only bones of contention in our small committee concerned the competitiveness aspect of the project. There were educators on our committee who inclined more toward the school of inclusiveness over pure merit, and who were concerned that rejection of their work would have a negative impact on the self-esteem of the less talented writers. Others, not educators but Jewish mothers with generous hearts, tended to agree. On this point, however, I invoked my privilege as editor and chair of the project. Either First Fruits must be a merit-based competition, or, I believed, it would be meaningless in the eyes of the contributors. If First Fruits was to fulfil its mandate as a vehicle for young writers’ love of writing, it had to separate the wheat from the chaff. As a competition, it appealed to the more serious writers, who looked upon their inclusion and certainly on their prizes as validation of their talent and encouragement to continue honing it. Besides, once we started receiving upwards of 1,000 submissions with the capacity to include only about 200, triage was inevitable, and merit was the obvious solution. Over the years, I was privileged to review the works of hundreds of young writers who had the basic qualities necessary to pursue writing as a serious hobby or as a career. My one regret – and a big one it is – that since we began the project in the days before computers were routinely used to organize and archive material, we were slow to benefit from its enormous capabilities. We should have started a database of our young authors and found a way of keeping track of their writing lives. I wonder how many of our previous prize winners are still in Montreal, and how many of them have gone on to a career in writing. (My son Jonathan was a prize-winner in 1984, and he is now my editor at the National Post.) I would love to see some former First Fruitsters responding to this column. The CJN might be just the writing home you are looking for.